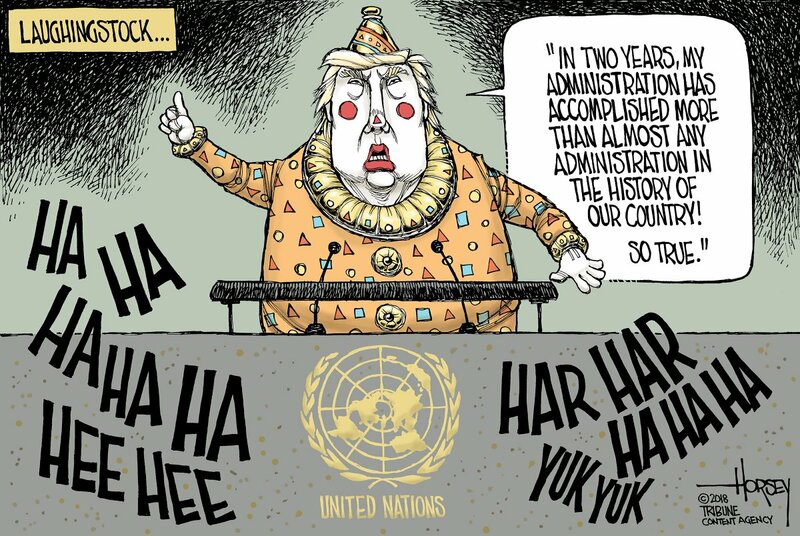 And in the United Nations yesterday, when Trump gave a speech, the world's leaders laughed at him. Hillarious, eh? 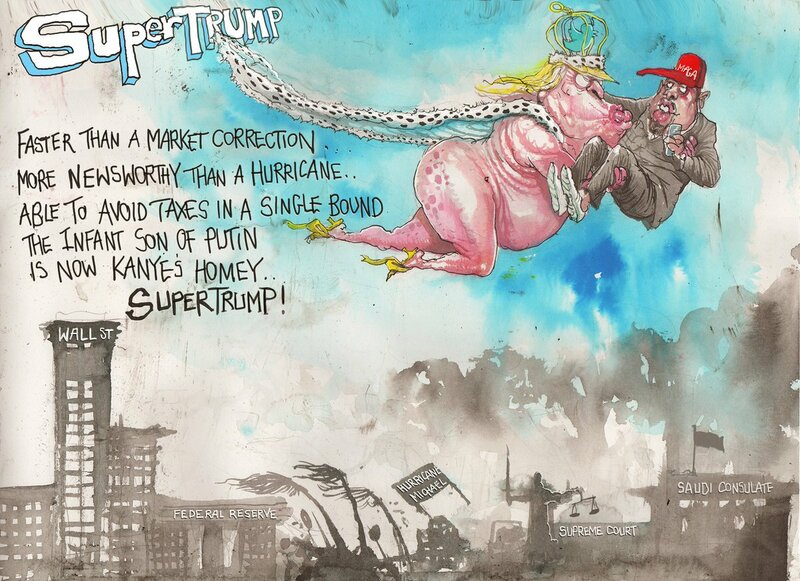 Trump has made himself and his country the laughing stock of the world. find out a lot about the Kavanaugh accusations in a week. And those were the good old days. President Trump's decision to order a one-week investigation into sexual assault allegations against Brett Kavanaugh, his Supreme Court nominee, comes in a time of almost indescribable pain and anger, lies and attacks. If truth were the only goal, there would be no clock, and the investigation wouldn't have been sought after the Senate Judiciary Committee already endorsed the nominee. Instead, it seems that the Republican goal is to be able to say there was an investigation and it didn't change their view, while the Democrats hope for incriminating evidence to derail the nominee. 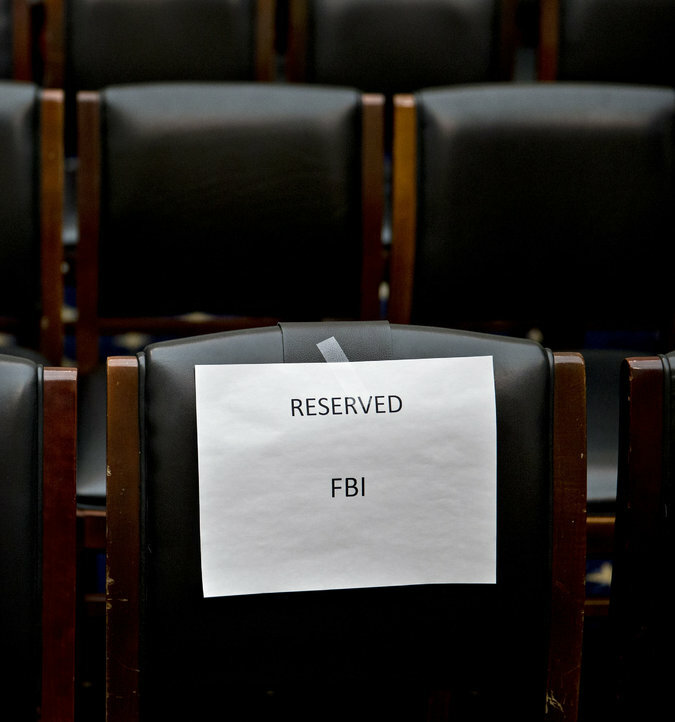 Although the process is deeply flawed, and apparently designed to thwart the fact-gathering process, the F.B.I. is up for this. It's not as hard as Republicans hope it will be. They will confront people with testimony and other accounts, testing them and pushing them in a professional way. Agents have much better nonsense detectors than partisans, because they aren't starting with a conclusion. Once they start interviewing, every witness knows the consequences. It is one thing to have your lawyer submit a statement on your behalf. It is a very different thing to sit across from two F.B.I. special agents and answer their relentless questions. Of course, the bureau won't have subpoena power, only the ability to knock on doors and ask questions. But most people will speak to them. Refusal to do so is its own kind of statement. Agents will summarize every witness encounter in a detailed report called a 302, and then synthesize all the interviews into an executive summary for the White House. Although the F.B.I. won't reach conclusions, their granular factual presentation will spotlight the areas of conflict and allow decision makers to reach their own conclusions. It is idiotic to put a shot clock on the F.B.I. But it is better to give professionals seven days to find facts than have no professional investigation at all. When the week is up, one team (and maybe both) will be angry at the F.B.I. The president will condemn the bureau for being a corrupt nest of Clinton-lovers if they turn up bad facts. Maybe Democrats will similarly condemn agents as Trumpists if they don't. As strange as it sounds, there is freedom in being totally screwed. Agents can just do their work. Find facts. Speak truth to power. Despite all the lies and all the attacks, there really are people who just want to figure out what's true. The F.B.I. is full of them. • James Comey is the former F.B.I. director and author of “A Higher Loyalty: Truth, Lies, and Leadership”. • A version of this article appears in The New York Times on Monday, October 1, 2018, on Page A19 of the New York print edition with the headline: “The F.B.I. Can Do This”. • Maureen Dowd: Capitol Hill Ralph Club — Brett Kavanaugh faces his moment of truth in a town that doesn't care about truth. • Frank Bruni: Brett Kavanaugh Loves His Beer — The Supreme Court nominee paired a frothy beverage with identity politics. • The Editorial Board: Women Are Watching — Which should make Republican lawmakers very, very nervous. Yeah, we get it ... you support rapists. Probably why you also support Donald J. Trump. make them cry and hes now slowly draining the swamp. Antifa are pretending to be the brownshirts doing what the nazi's done. It's a thankless job but someone needed to do it. …the whole lot of them are sickos who deserve to be castrated with a blunt knife. a dark mood for Joe Bennett. — Photograph: Ricky Wilson/STUFF. GRIM MORNING, fit for a funeral, under rat-belly clouds so low you could touch them. And with a head full of the loathsome Trump I drove the dog to the recreation ground as a way of cracking the gloom. You can see Trump's plan. He's hopelessly corrupt, so if he's to prevail he has to defeat the rule of law. To this end he's put a stooge in charge of the Department of Justice, and what he hopes are stooges on the Supreme Court, and he's tried to vilify the Special Counsel who by now knows all his crimes. And Trump has fawned to the military. 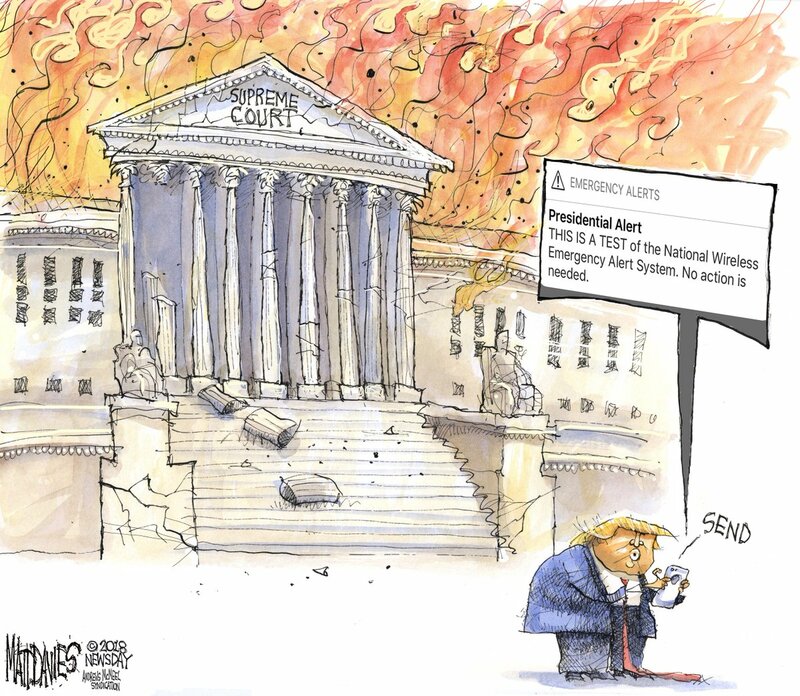 Because when the conflict comes, when Trump finally defies the order of a court, he'll need the military on his side, along with the three-headed hydra of right-wing American politics, the bigots, the Baptists and the billionaires. Trump shouldn't prevail, of course, but by the same token he should never have been president. And if he does prevail, darkness falls. Indeed you can already see it falling. Ah well. The recreation ground had been mown. At the age of 19 I had a job as a groundsman and I discovered the joys of mowing. Seated on the tractor I looked ahead of me at disorder — daisies flowering on the cricket field, grasses sprouting to uneven lengths — but when I looked behind me there was order, a grass carpet, uniform in length and colour. With my fierce and spinning blades of metal I'd imposed dominion on the earth and it was good. Even today, if I am sour of mood, I find that mowing the lawns can lift the clouds, as can imposing order in some other way — cleaning the fish tank, say, or picking the clothes-drift from the bedroom floor. Order is balm. But not for dogs. They like things natural. At the recreation ground my dog went straight to the margins, the unmown vestiges of wilderness, where the swaying grass heads and the unkempt shrubs told stories of what had passed that way, stories echoing back to the plains of Africa and the birth of his species. On the far side of the rec was a patch that the mower had missed for its last few visits, a few square metres of longer grass, and with the dog engaged elsewhere I wandered over to see what was what. And what was what was clear. The unmown patch was a swampy depression and the council mower man, reluctant to risk his machine in the bog, had simply skirted it. It ruined the uniformity of the mowing but one could hardly blame him. But even as I was on the point of turning away, in the midst of the swamp a duck's head popped up like a periscope. The bird eyed me a moment, decided I posed a threat, stood and lurched a little further away from its nest in the endearing manner of ducks. 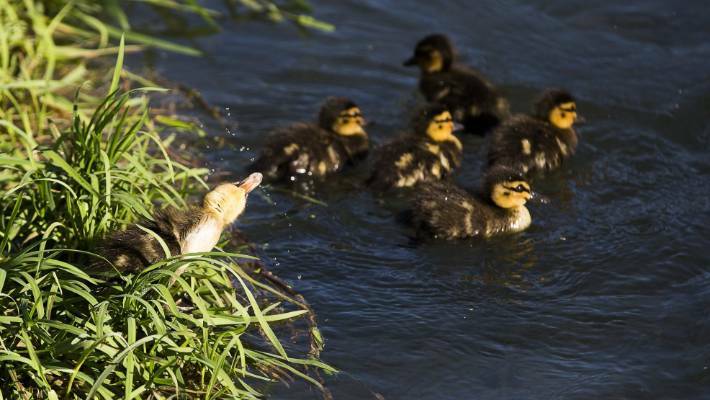 As it went it quacked quietly and it was then that I saw the brood of ducklings, fluff-balls that could not have been more than a few hours old and that clambered over the ridges of the swamp as if over Himalayan foothills. And what was what seemed newly clear. The mower-man hadn't been avoiding a bog. He'd been saving a nest. And if a man on a council mower can steer round a duck for a month, well, that would do me. • Julian “Joe” Bennett is a writer, columnist and retired English school teacher living in Lyttelton, New Zealand. Born in England, Bennett emigrated to New Zealand when he was twenty-nine. Go and google Michael Cohen and read the latest news stories. Then go and read the idiot Donald J. Trump's latest tweets. It's hilarious reading, seeing Trump lashing out in panic as the walls close in. I reckon it's getting very close to indictments against Donald Jr., Eric and Ivanka Trump. Robert S. Mueller III is going to have the final say about the entire corrupt, criminal Trump family. And from early next year, the U.S. Congress will be appointing a shitload more special investigators to dig into Trump family criminal activities. Yes, you hit the nail right on the head. Michael Cohen told a shitload of lies on the orders of Donald J. Trump. And he got caught lying to the Feds about it. So now he has done the decent thing and pleaded guilty in an attempt to save his own skin. After all, why should he go down when he was merely carrying out criminal acts on behalf of and on the orders of Donald J. Trump? The instant the 46th President of the United States of America is sworn in should be a very entertaining piece of theatre as the handcuffs get slapped on the wrists of the 45th President and he gets led away to jail in front of the 46th President's inauguration crowd.